I have used a Masking Fluid Pickup to remove all the masking. This tool is wonderful! It quickly and cleanly removes all of the masking without smearing or smudging your painting. You can purchase this tool at most art supplies stores, and also online at CheapJoes.com. 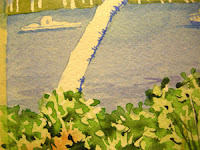 Using French Ultramarine Blue I have added some shadows to my palm tree trunk, and to the boats and bridge. Even though we are not painting the minute details of the bridge, the direction and value of the painting in the shadow areas is very important. Notice the little angle of the shadow on the pillars under the bridge. Also notice that the shadow directly under the roadway is a different value than the pillar shadows. Use care when applying the shadows to the boats also. I try to pay attention to value (lightness and darkness) and shape. It helps to squint at your reference photo to see the values and shapes. When these elements are given attention, even a single, tiny brushstroke will make your element believable. 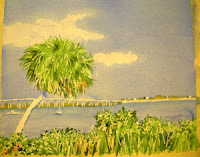 You can see more of my finished artwork at http://watercolorworksart.com.